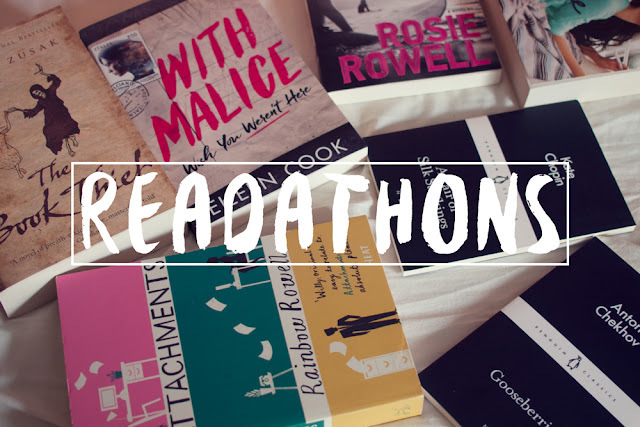 For any of you out there who, like me a few years ago, have no idea what I'm even talking about, a readathon is an event, usually organised by someone with a blog or youtube channel, during which the people taking part try to read as much as possible. Sometimes there are challenges for the sort of books that should be read but the idea is usually just to read as many books as you can over a specific period of time. So what is the appeal of readathons? Well, if you're like me, and you have a tendency to buy books faster than you can read them, it's a great opportunity to get through some of that TBR. If you're someone who loves to read but doesn't always make the time for it, it's a good excuse to push yourself to try and find extra reading time wherever you can. If you're just the kind of person who really loves to find a challenge in everything you do then readathons are absolutely the perfect chance to bring that competitive spirit to your reading too! For me though, the best part of readathons, especially big ones like the BookTube-A-Thon, is the communal aspect. Knowing that you are taking part in this challenge with people from all over the world. Watching daily update videos, searching through the hashtags on Twitter and Instagram. Sharing a week of reading with people you've never even met or spoken to before. That's my favourite thing about readathons. What's your favourite thing about readathons? Or your least favourite thing if you're of the anti-readathon persuasion. Let me know in the comments!